Although the Dolichoderinae sub-family of ants is a large one elsewhere in the world, in South Africa there are only about 13 indigenous species, of which three are Axinidris. The very rare Axinidris lignicola is one of the few indigenous Dolichoderinae in Southern Africa. Other members of the sub-family here are the invasive Argentine ant (Linepithema humile) and a few species of the Pale-footed ants (Technomyrmex sp). The seriously-invasive Technomyrmex albipes [White-footed ant], a native of Indonesia, has apparently not been found here – yet! The imported invasive Argentines live in large, interconnected ‘super-colonies’ that expand by budding, the process whereby queens run in the trails with the workers and, if conditions are favourable, establish new sub-colonies at the food source. In this way they can expand rapidly over huge areas, at the expense of indigenous species. Dolichoderines tend to smell when crushed, usually an unpleasant scent such as old cheese or even faeces. They have naked pupae and they usually run in trails; in all species the sting has been replaced by a poison-secreting gland which seems to be a major factor in their ability to overcome and destroy other ants. This invader ability even extends to our largest and our most aggressive indigenes. 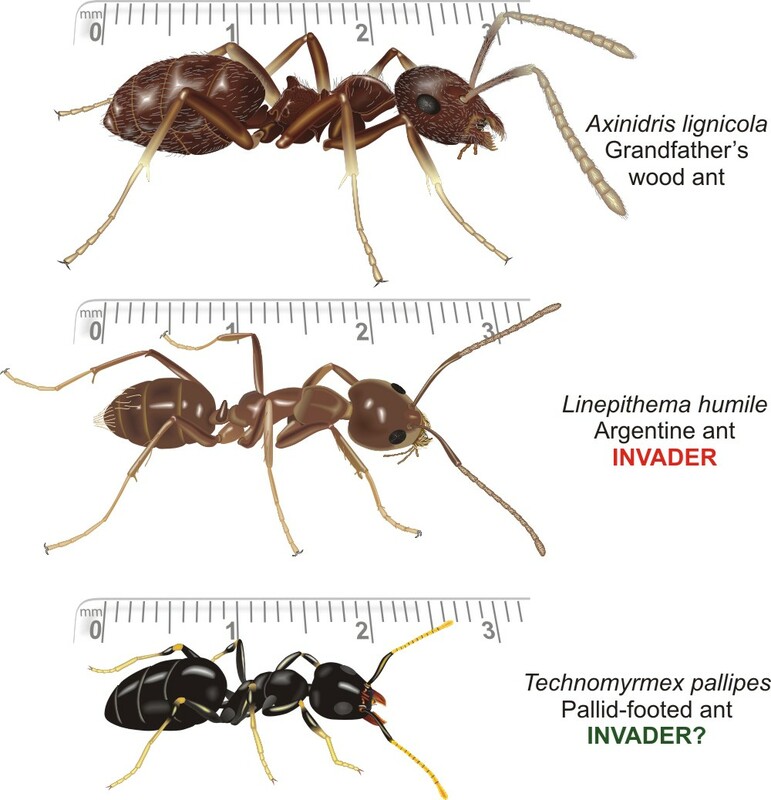 What’s more, it seems to have an effect amongst different species of invasive Dolichoderines themselves: Pale-footed ants such as Technomyrmex pallipes [Pallid-footed ant], for example, seem to be able to drive Argentine ants away from their chosen habitats. On the contrary, our indigenous Grandfather’s wood ant (Axinidris lignicola) falls prey to other indigenous ants and may be a threatened species.